Families will have tons of fun visiting the Bowling Green area. Here you will discover family activities like caverns, farms, amusement parks, and more. After just one visit, you’ll see why it is a fast growing city, and why Bowling Green, Kentucky with kids can be the perfect family vacation! Families will have a great time together when they visit Bowling Green, Kentucky. Around Bowling Green, discover caves everywhere that kids will love exploring. Visit farms for a unique educational activity or the kids head to the local amusement park to ride the rides. Families won’t run out of things to do when visiting Bowling Green, Kentucky with kids. Chaney’s Dairy Farm is one of the must fun things to do in Bowling Green with kids. On-site is a cafe with great food, including ice cream made from the cows that call this farm home. Families can take an educational tour where they show off the Laley Astronaut robotic milking system. Chances are high no one in your family has seen a cow milked robotically, right? The farm has a massive jumping pillow, kids can bounce on for an extra fee. The playground is free and they show free movies every other Friday on the side of their barn. Mammoth Cave is the world’s longest cave and it has yet to be fully explored. It covers 405 miles and is so large that some of the cave is not included in the national park. There are people currently searching for more parts of the cave! But it isn’t just people down there, 160 species of animals go into the cave. In 1816, visitors started touring the limestone cave making it one of the oldest attractions in the United States. By 1920, George Morrison discovered that there was more cave, so he created a new entrance in 1921, ultimately selling it to the park service in 1932. The “Frozen Niagara” is the most photographed part of the cave and this tour is kid friendly. Lost River Cave offers underground cave tours by boat. (Unfortunately, be aware if it has been raining a lot the water levels get too high and the boats can not operate in the cave.) The walk down to the cave is extremely scenic, crossing over a gorgeous wooden bridge and passing by natural blue holes. Near the gift shop and parking lot is a natural playground for kids. There is a trading post for children as well every other Saturday from April to October. Here children can trade items like a leaf, acorn, or snake skin for a new item. Kids have to tell the worker about their item before they trade it in. Participating in the trading post is completely free. Lost River Cave offers all kinds of year-round family activities. In the summer they participate in the Great American Camp Out and families can join in for just $25. They also offer camps throughout the summer on Saturdays including a stem camp. Compete in their 5K, the Snow Flurry Scurry in January each year. While during the fall, local businesses decorate scarecrows for the Scarecrow trail. December features kid-fun activities including a reindeer encounter, meeting with Sant and Mrs. Clause, and sipping hot chocolate. Lost River Cave has plans to add zip lining by the end of 2017 with three segments and kiddie zips. Fun Fact: Reportedly, Jesse James and his gang hid out in this cave in 1868 after robbing a bank! Bowling Green has its own small amusement park and water park — Beech Bend and Splash Lagoon, and both include rides for all ages. One ticket gets you into both sections of the park. The amusement park has a wooden roller coaster called the Kentucky Rumbler that gets going really fast! Be sure to check out the Sea Dragon, a ride that came from Michael Jacksons Neverland Ranch. The water park has a lazy river, wave pool, and lots of slides. Did you know that Corvettes have been made in Bowling Green, Kentucky since 1981? 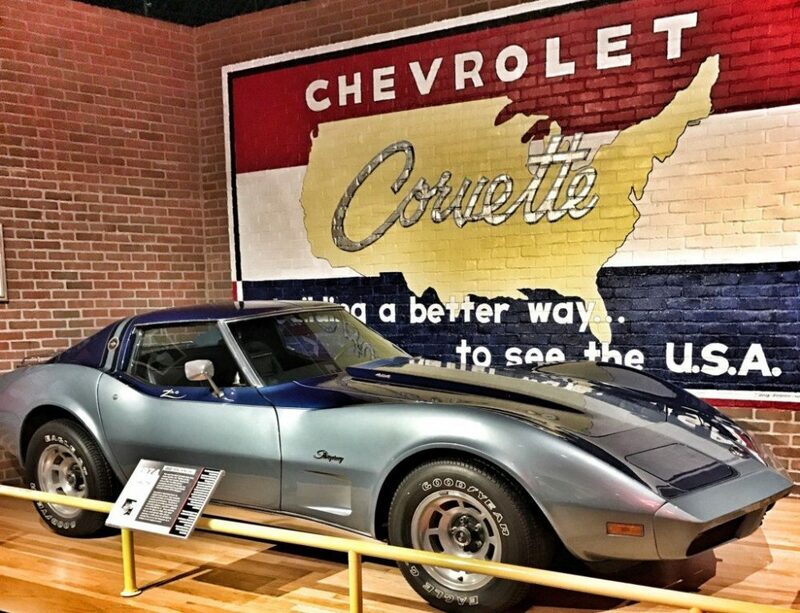 Across from the Corvette plant is the National Corvette Museum with 80 or more different Corvettes from the first Corvette made in 1953 through present day. If you appreciate cars you will love this museum. Aviation Heritage Park is home to a Phantom 550, a Grumman Panther F9F, a Lockheed T-33 Shooting Star, an F-111 Aardvark, and a NASA T-38 Talon. Basil Griffin Park is a 111-acre park next to a lake with multiple sports fields & courts, 5 playgrounds, disc golf & hockey rink. Kids will love having so many playgrounds to choose from and feeding the ducks. You can take a tour of the General Motors Corvette Assembly Plant and see in person how America’s favorite sports car is built. Tours have paused for now, but should resume in June 2019. Kentucky is famous for its bourbon and Bowling Green has their own, the Corsair Artisan Distillery. Visitors can tour the distillery and see first hand how they create their “hand-crafted small batch ultra-premium booze”. At Red Door Puzzle Rooms families can compete against the clock solving to mystery through riddles, puzzles and more to escape the room. Russell Sims Aquatic Center is a pool and water park featuring zero depth entry, palm trees, water buckets, lemon drops, splash playground, and beautiful beach area. It also has a 50 meter pool, two water slides, and two diving boards. One somewhat unusual activity you can do is visit a salt cave. This local salt cave features six tons of Himalayan Salt. According to some, salt caves may help alleviate symptoms of asthma, allergies, respiratory issues, anxiety, depression and many other ailments. Guests can drop in for a 45-minute session in the cave where they sit in a recliner and rest. I however could not calm down enough to sit through a session. I almost had an anxiety attack and I don’t have anxiety issues. Go figure. Bowling Green, Kentucky has some seriously good restaurants and you will want to make sure you plan time for leisurely meals. Lost River Pizza – Head here for some interesting food like fried pickles doused in Buffalo sauce, Brisket, BBQ, apple pizza, or baked potato pizza! For adults, there are 30 beers on tap. The kid’s menu has lots of options kids will like, all for $6 or less. White Squirrel Brewery – If you want to try some local beers, this is the place! This Bowling Green brewery has great food and beers and it is family friendly! I recommend trying their sweet and spicy margarita or the jalapeno beer to pair with their tacos. Wild Eggs – All of the food here is fantastic, from the granola to the muffins to the crepes! I highly recommend the Kalamity Katie’s Border Benedict, because it is one of the best breakfast items I’ve ever had. Montana Grill – For a slightly more upscale dining experience, visit Montana Grill. This restaurant is still casual, but the food is higher end. Their filet mignon is superb as is all of their steaks and seafood. In Bowling Green, I stayed at the Fairfield Inn and Suites. A family of four could easily stay in one of their rooms with its king size bed and sofa / hide-a-bed. Kids will love its indoor pool, but sadly there is no hot tub. Complimentary breakfast is served each day, which is an essential when traveling with kids who always wake up hungry aka teens! Have you been to Bowling Green, Kentucky? We would love to hear about your trip and your suggestions in the comments below!